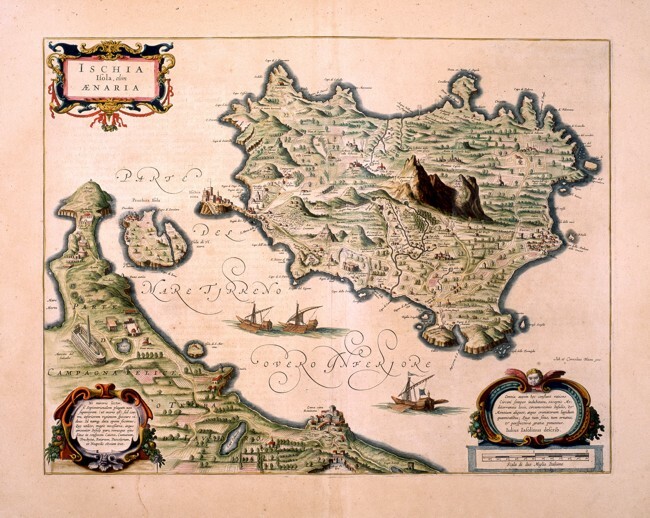 Description: The Island of Ischia with the Peninsula of Capo Miseno and the little Island of Procida in the centre. The title picture appears on the top left. 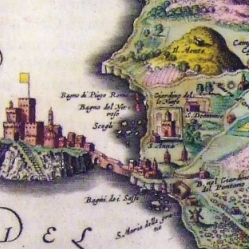 Two decorative pictures contain some information written in Latin, a metric scale of two Italian miles is on the bottom right. There is a exact description of the mountains: the Monte Epomeo is in the centre next to the Monte della Custodia. The Island seems to be intensively cultivated and is coloured a beautiful green. Three sailing ships are on the sea. There are castles and fortifications, the villages are indicated with white walls and red roofs. The little town of Ischia lies on a big rock connected to the rest of the island by a bridge. The map shows water courses everywhere and springs of hot water, called sudatory. The Villa of Lucullo and the Roman Theatre appear on the mainland. Measuring 49 x 37,5 cm, this map is taken from the Blaeu altlas Theatrum Orbis Therrarum, printed in the 17th century in Amsterdam.